Is The Rise In U.S Treasury 10-Year Yields Over? The answer is probably yes, over the intermediate-term that is. Clearly, the Fed’s unexpected decision to keep the rate of monthly security purchases at an $85 billion clip helped blunt the interest rate rise. Worries over the quality of job gains in recent months has also been an important factor. Political wrangling over Obama-care and perhaps the debt-ceiling a few weeks from now has also kept business hiring plans in low gear. Moreover, the rise in U. S, Treasury 10-year notes (TNX) rates played a big part in the slowdown in mortgage applications and mortgage refinancings during the period of rising rates prior to September 5th. That slowdown resulted in staff cuts in the mortgage divisions of Wells Fargo (2,300 jobs), Bank of America (2,100), Citigroup (1,000) and J.P. Morgan (15,000) which highlighted the sensitively to a rising interest rate environment. It is interesting to note that since September 5th, after which 10-year note yields began to decline, weekly mortgage applications rose by 11.2% and 5.5% respectively (on a seasonally adjusted basis). Since analysts look to the housing sector to keep economic conditions moving forward, the Fed may be persuaded to stay with their high level of purchases of treasuries and mortgage-backed securities (MBS) for a longer period of time than most observers expect. From a technical point-of-view, the TNX found resistance at the 2.984% level on September 5th …which is where key “cross” trend line resistance currently sits. 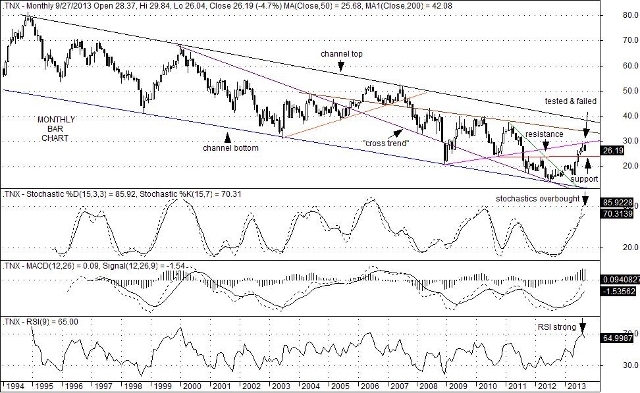 In addition, overbought conditions on long-term charts suggest that the momentum of rising rates has likely been snapped for at least the intermediate-term. A sense of complacency in the equity markets, highlighted by low volatility readings, and a general expectation that interest will resume rising sometime soon may have investors looking past the current period of uncertainty. They may also fail to see that the current environment of low personal savings rates and wide corporate profit margins may not be able to co-exist indefinitely. Thus, an unwinding of that particular relationship could sent equity prices lower and bond prices higher over the intermediate-term, which may be a set of events that are relatively unexpected at this point-in-time. Although yields on U.S Treasury 10-year notes (TNX) closed at 2.58% on Friday, longer-term charts suggest that a break above the recent resistance high at 2.737% could occur soon. If a move above 2.737% were to emerge, a push up toward the 3.40% area could result over the next few months or so. Clearly, the implantation of the much-anticipated taper could trigger the initial break above 2.737%, even though it is widely expected. 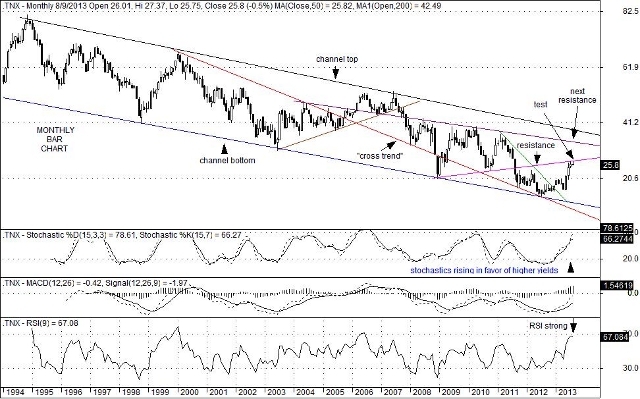 A further decline in the value of dollar index (DXY) or possible hints of another credit downgrade on U.S. treasuries (with a debt ceiling battle coming soon) could add to this higher-rate scenario. Nevertheless, a number of Fed officials clearly sent a message to investors last week that the taper is coming, but a tightening is not. Bond traders might respond to this collective missive by establishing new yield curve steepening positions. Still, bank loan officers as well as would-be borrowers may well welcome this kind of maneuver. A steeper yield curve, while detrimental to mortgage borrowers over the short-run, could trigger an increase in commercial and industrial loan formation. Since wider profit margins accompany steeper yield curves (with banks borrowing low yielding short-term money, and lending at ever increasing long-term rates), a built-in incentive to increase lending activity might be ignited. Such a scenario would be helpful to small-to-medium sized businesses and could help them in their hiring and expansion plans. Of course, these types of outcomes will take some time to develop, but the odds are that they will unfold and they will develop. In the long-run, that will be helpful to economic growth and equity prices alike. You are currently browsing the archives for the 10-Year Treasury Note (TNX) category.